An integrated computer program for the design of the hullform, calculation of the resistance and propulsion characteristics, tonnage and deadweight, tank capacities, intact stability, grain stability, damage stability, probabilistic damage stability and longitudinal strength of the ship. Modules include Fairway which provides an alternate to NURBS and Locopias loading and damage evaluation. Web Site Snapshot: If available, above is a snapshot of the Pias web site at http://www.sarc.nl/ as it appeared when this site was added to the directory or last verified. 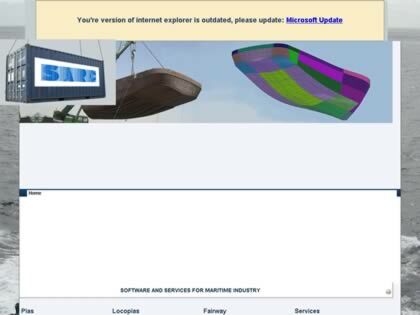 Please Note that Boat Design Net has no involvement with the above web site; all content and images depicted in the above thumbnail are the property and copyright of Pias unless otherwise noted on that site. Description: An integrated computer program for the design of the hullform, calculation of the resistance and propulsion characteristics, tonnage and deadweight, tank capacities, intact stability, grain stability, damage stability, probabilistic damage stability and longitudinal strength of the ship. Modules include Fairway which provides an alternate to NURBS and Locopias loading and damage evaluation.